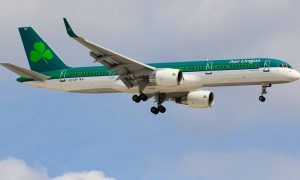 Aer Lingus Regional’s Donegal-Dublin route grew 21% in February 2015 compared to the same period last year, according to figures released by the airline. With a coastline of 1,235km, County Donegal is home to some of Ireland’s most beautiful beaches, twelve of which are Blue Flag Beaches. The county is also recognised as one of Europe’s most popular surfing destinations, and in recent years its coastline has witnessed some of the biggest waves ever recorded in Europe. In this time, the Donegal-Dublin route has become an integral element of the North West’s tourism and transport infrastructure. Aer Lingus Regional’ operated by Stobart Air was awarded the tender to provide air services on the Public Service Obligation (PSO) route from Donegal to Dublin last November. Aer Lingus Regional has a strong track record in servicing Irish domestic routes, with domestic passenger numbers growing month-on-month. “We are extremely pleased with Aer Lingus Regional’s continued success, and particularly delighted to see such strong growth on our Donegal-Dublin route in the first month of service. Donegal is home to some of Ireland’s most beautiful beaches and is now considered amongst the best surfing destinations in Europe.